Mobile telecommunications services are fundamental for the effective functioning of the State as they are critical for national security and for economic and social activity. However despite the clear importance of this service, and with its immense infrastructure and meshed networks built to support the deployment of the service, mobile network operators continue to suffer fiber cuts, which disrupts service quality and interrupts with the network. 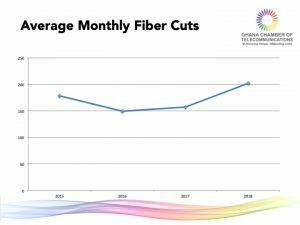 Last year, the mobile industry recorded a monthly average of 200 fiber cuts affecting close to 38% of all network interruptions and hampering set quality of service targets within the year. 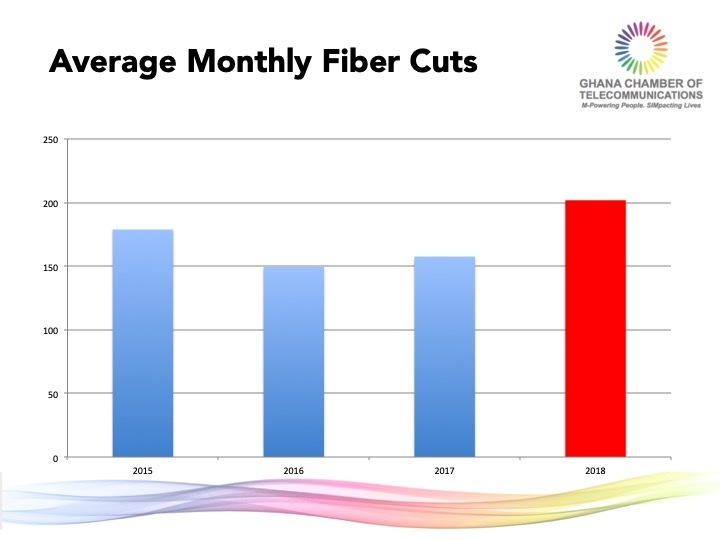 The Ghana Chamber of telecommunications has continuously advocated, that the cuts to fibre-optic cables reduce network reliability, affects customer experience on the network and increases the service provider’s operational costs which further reduces rural network expansion and affects last mile connectivity strategies. Private developers are the biggest cause to destruction of fiber optic cables, and then contractors of roads and drainages, farmers and other utility service companies who access the road reservation corridors. 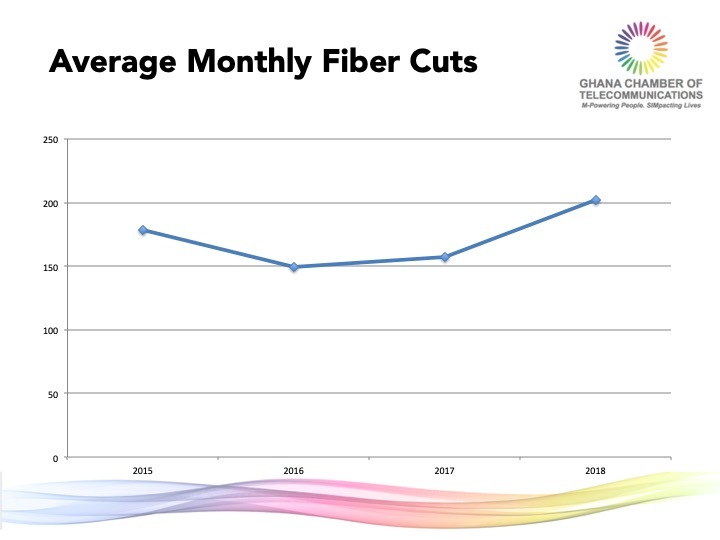 It is significant to note that incessant cuts on Ghana’s fiber optic network results in degradation of optical signal levels due to the additional splicing/joints that are created during continuous repairs and this can ultimately degrade service quality. In ensuring network improvement, service providers are faced with the challenge to replace long spans of fiber to eliminate the said joints, and this comes at huge costs and extended time in restoring network outages. Mobile Network Operators spend about ¢17,000 cedis to repair every single cut on their network and this costs the industry about a monthly average of ¢3.4million cedis. There are also additional maintenance costs due to relocation requirements, as well as customer compensations and loss of revenue to government and service providers due to network downtime and also brand and reputational damage, which cannot be easily quantified. Section 77 and 78 of the Electronic Communications Act 2008 (Act 775) undoubtedly makes fiber cut a criminal offence, however Ghana continues to attain the negative tag of one of the countries with the highest number of fiber cuts, irrespective of these existing laws. Any Road, Drain or Building Contractor, GWSC and ECG Workers, Private Developer or their staff who recklessly, maliciously or negligently damages, removes or destroys fiber cables used in connection with the operation or provision of electronic communications network or service, commits an offence, and is liable on summary conviction to a fine of not more than three thousand penalty units or to a term of imprisonment of not more than five years or both. As the mobile industry engages various stakeholders; such as the National Engineering Coordinating Team, Road Agencies, Other utilities, Road Contractors Association, GREDA etc to showcase the negative impact of these cuts on the lives of Ghanaians. We also wish to educate and alert the general public to the fact that persons who cause damage to optical fiber cables and other telecommunications infrastructure are liable to a summary conviction of 5years. There is the need for a Multi stakeholder approach to resolving the challenge of fiber cuts. We (policy makers, regulators, operators, other utilities and operators within the built environment) all have roles to play. At the launch of the industry CERT in October 2018, the Director General of the Telecommunications Regulator, gave clear intentions to enhance security of fiber networks. The Industry will work with the NCA to ensure that telecommunications infrastructure is characterized clearly so as Critical National Infrastructure. It is important that as a country we treat fiber infrastructure as a critical national asset, which will warrant punitive actions against wanton destruction. As we work to create awareness of the impact of destruction of fiber network on our user experience as telecommunication customers. The mobile industry entreats the Police, the Attorney General; and the Judiciary to support the effective criminalization of these acts to reverse the current trends.